TERRIBLE tragedy struck at home in County Limerick while Cappamore fire station officer, John Mulready was climbing Mount Everest. 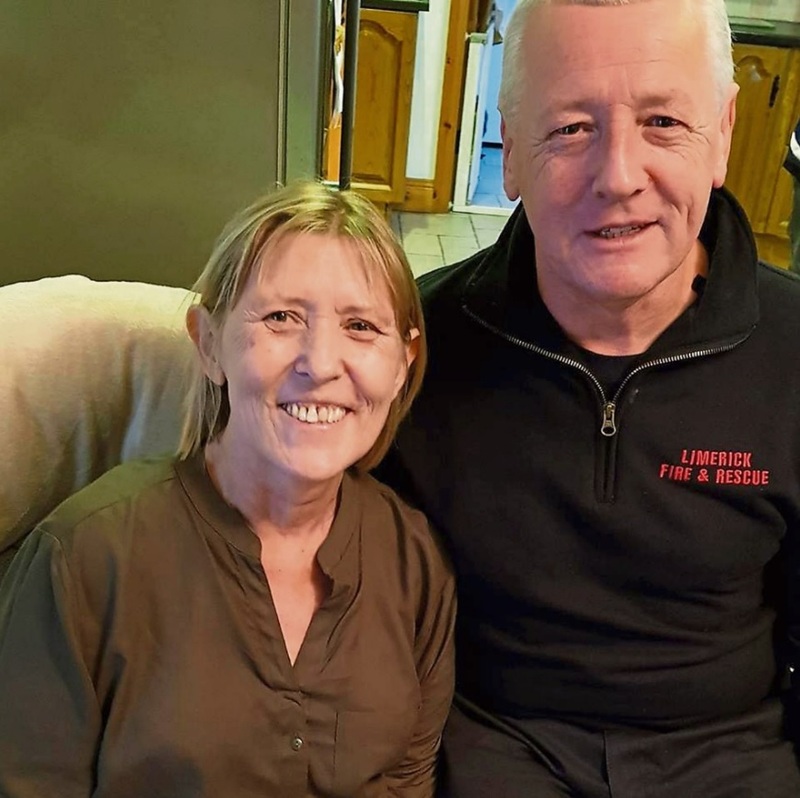 He received the heartbreaking news that his sister Angela O’Connell passed away suddenly from cancer on Friday, October 12 – just two days after he flew to Nepal. The 55-year-old mother-of-four, who was only diagnosed with cancer a couple of weeks ago, was laid to rest on Sunday after requiem Mass in Cappamore church. Sara Ryan, a sister of Angela’s, said she and the whole family was still in shock. “I still can’t believe it. We’re all devastated. She was sick about five weeks ago. She went for a blood test and they said her blood counts were low. “They gave her a blood transfusion, they did everything for her. They told her they couldn’t do anymore. They couldn’t say how long she had left. She had breast cancer 10 years ago. She got the all clear but the cancer came back,” said Sara, who lives in Pallasgreen. Angela, married to John, had four children – Samantha, aged 32, John Paul, 29; Philip, 23 and Abbie, 14. Sara described her older sister as a “wonderful mother”. “She was a real mammy. You would always find her in the home. She would always be baking or gardening. You would always find her in the kitchen. She was a wonderful mother and fabulous sister,” said Sara. This is epitomised by Angela planning to wait until the mid-term break to tell her youngest daughter, Abbie, about the terminal diagnosis. “She told her on Thursday night and she died on the Friday morning. Nobody expected it to be so soon. She went shopping on the Tuesday before it. She looked grand just a bit pale. On Wednesday she was tired but still getting up,” said Sara. Angela passed away peacefully at her residence in Towerhill, Cappamore on Friday. Their brother, John, flew out to Nepal two days earlier to climb Mount Everest and raise money for Autism Ireland. He called to see Angela on the night before he left and they took a photograph together. “He had this T-shirt printed for her with the words, ‘I wear pink because I love my sister’. John said he wouldn’t bother going to Everest and she was giving out to him that he should go. She was insisting and he could see how well she looked. “When he gets to the top of Everest he was going to take a picture of him in the T-shirt and send it to her. He didn’t get the chance...” said Sara. John had told Sara to let him know every day how Angela was doing. As she couldn’t get through on the phone Sara had to message him that Angela had passed away. “He didn’t get that for a couple of hours because he was on a flight. He was devastated. It was like Angela waited until he had gone to the next part of the trip, that if he wanted to come back he wouldn’t have been able to,” said Sara. John had flown in to the remote Lukla airport in the Himalayas with Scott Keenan, senior assistant chief fire officer in Limerick city; Niamh O’Leary, who works in UHL and Aine Fleming, paramedic. In a message on Facebook, John said: “Thank you everyone. As you know I am absolutely heartbroken. Thank you all for your kind messages. The group here have been fantastic looking after me. Speaking to the Limerick Leader last week in advance of the charity climb, John said the plan is to reach Everest base camp this Saturday, October 20 , stay overnight and go up Kala Patthar, reaching 5,645 metres. John will proudly wear the T-shirt in memory of his loving sister at the top. Angela’s passing is the latest tragedy to befall the Mulready family. Sara’s 17-year-old-son, Kenneth Ryan, died in a quad bike accident in 2014. Limerick hurler Colin Ryan “Malachy” brought the Liam MacCarthy Cup to the grave of his good friend after the All-Ireland win. Sara’s brothers Peter and Billy died in 2015, another brother Lawrence passed away in 2016 and now Angela is the fourth sibling to go to their God. “John is the only boy left with me and my sister Patricia. John has all his family on his mind and in his heart on this climb,” Sara. Large crowds paid their respects to Angela’s family at their home in Towerhill on Saturday evening and at her funeral Mass in Cappamore church on Sunday. “People never stopped coming on Saturday evening and the church was packed on Sunday. People were lovely,” said Sara. Angela is sadly missed by her loving husband John, daughters Samantha and Abbie, sons John Paul and Philip, brother John, sisters Patricia and Sara, grandchildren Michaela, Jamie, Mason, Kyle and Charlotte, son-in-law John, partners Tegan and Gabby, mother-in-law Johannah, brothers-in-law, sisters-in-law, nieces, nephews, relatives, neighbours and friends.